Why do you think many Christians don’t look forward to Heaven anymore? Christians faced with death often feel they’re leaving the party before it’s over, having to go home early. They are disappointed, thinking of all the people and things they’ll miss when they leave. But for God’s children the real party awaits. Think of the Father making merry and celebrating with a feast for the prodigal son who’s come home (Luke 15). The celebration is already underway at our true home, where we’ve not yet lived; and that’s precisely where death will take us. As others will welcome us to Heaven’s party, so we’ll one day welcome those who arrive later. God commands us in his Word to set our minds in Heaven where Christ is (Colossians 3:1). We focus on an actual place where the resurrected Christ lives, and the resurrected cosmos, our future and eternal home. Paul says, “I consider that the sufferings of this present time are not worth comparing with the glory that is to be revealed to us” (Romans 8:18). If we don’t understand this future glory of Heaven that awaits us, we won’t see that our present sufferings shrink in comparison to its greatness. What God made us to desire is exactly what he promises to those who follow Jesus Christ: a resurrected life in a resurrected body with the resurrected Christ. 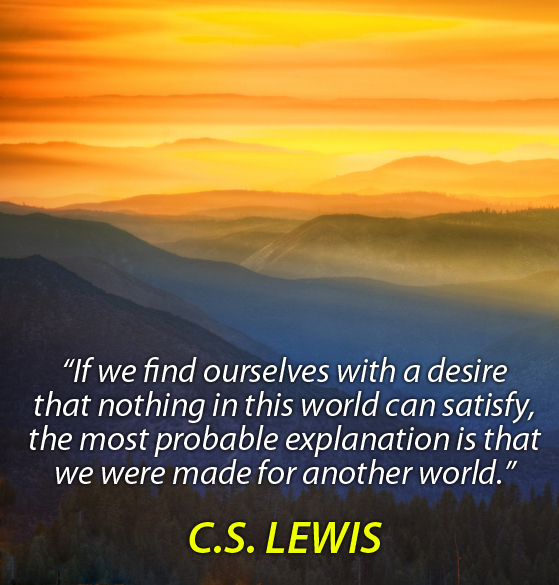 Our desires correspond precisely to God’s plans. It’s not that we want something, so we engage in wishful thinking. It’s the opposite. We want eternal life because God has wired us that way, and has always planned for it (Ecclesiastes 3:11). The belief that Heaven will be boring betrays a heresy— that God himself is boring. There’s no greater nonsense. Our desire for pleasure and the experience of joy come directly from God’s hand. He made our taste buds, adrenaline, and the nerve endings that convey pleasure to our brains. Likewise, our imaginations and capacity for joy were made by the God whom some imagine is boring. Are we so arrogant as to imagine that human beings came up with the idea of having fun? “Won’t it be boring to be good all the time?” This assumes sin is exciting and righteousness is boring, which is one of the Devil’s most strategic lies. Sin doesn’t bring fulfillment, it robs us of it. When there’s beauty, when we see God as he truly is— an endless reservoir of fascination— boredom becomes impossible. Words describing eating, meals, and food appear more than a thousand times in Scripture, with the English translation “feast” occurring 187 times. Feasting involves celebration and fun, and it’s profoundly relational. Great conversation, storytelling, relationship-building, and laughter happen during mealtimes. Feasts, including Passover, were spiritual gatherings that drew attention to God, his greatness, and his redemption. People who love each other love eating together. In a parable when Jesus wanted to describe heaven, he used the image of a feast given by a king (Matthew 22:2). In another place Jesus said to his disciples, “I confer on you a kingdom, just as my Father conferred one on me, so that you may eat and drink at my table in my kingdom” (Luke 22:29-30). Jesus promised, “Many will come from the east and the west, and will take their places at the feast with Abraham, Isaac, and Jacob in the kingdom of Heaven” (Matthew 8:11). The finest foods and drinks, according to Isaiah 25:6, will be prepared for us by God himself. Scripture tells us we will all be living with the same person (Jesus), in the same place (Heaven), with God’s people. Paul says in I Thessalonians 4:18 that we are to “comfort one another with these words,” in reference to our being together with the Lord forever. So clearly we will be spending eternity with our loved ones in Jesus. Christ said that there won’t be human marriage in Heaven (Matthew 22:30). Yet there will be marriage in Heaven, one marriage, between Christ and his bride— and his people will all be part of it (Ephesians 5:31-32). My wife and I won’t be married to each other, but will be part of the same marriage to Jesus (Ephesians 5:31-32). I have every reason to believe that in Heaven, I will be closer to my wife and kids and grandkids than ever. It won’t be the end of our relationships, but they’ll be taken to a new level. Our source of comfort isn’t only that we’ll be with the Lord in Heaven, but also that we’ll be with each other. Christ promises that, “There will be no more death or mourning or crying or pain, for the old order of things has passed away” (Revelations 21:4). Since “the wages of sin is death” (Romans 6:23), the promise of no more death is a promise of no more sin. Those who will never die can never sin, since sinners always die. Sin causes mourning, crying, and pain. If those will never occur again, then sin can’t. We will have true freedom in Heaven, a righteous freedom that never sins. Since Adam and Eve sinned, despite living in a perfect place, as did Satan, many people wonder if we’ll sin someday in Heaven. The Bible says that God cannot sin. It would be against his nature. Once we’re with him, it will be against our nature too. We won’t want to sin any more than Jesus does. Sin will have absolutely no appeal to us. The memory of evil and suffering in this life will serve as an eternal reminder of sin’s horrors and emptiness. Sin? Been there, done that; seen how ugly and disastrous it was! Why would we want our friends to spend eternity in a dull place? And why would they want to go there? And nobody wants to be a ghost when he dies. On the other hand, when Christians understand Heaven is an exciting physical place on a redeemed world with redeemed people in redeemed relationships without sin and death, where there is music, art, science, sports, literature, and culture, it’s a great source of encouragement and motivation. Colossians 3:1 — Since, then, you have been raised with Christ, set your hearts on things above, where Christ is, seated at the right hand of God. Ecclesiastes 3:11b — He (God) has set eternity in the human heart. O Lord, you have prepared for us a wonderful place. Prepare us also for that place. Amen.